Vectors (or empty backbones) are frequently used in molecular biology to isolate, multiply, or express the insert they carry in the target cell. These vectors allow you to test the function of Your Gene Of Interest (YGOI) in a controlled environment under various conditions. The first thing you'll need to decide when running your experiment, is which vector will best suit your needs? 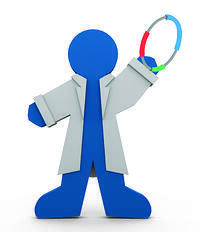 At Addgene, we have a vast collection of empty backbones that have been designed, tested, and published by academic scientists. To help you find the vector that fits your experiments, I've described below some of the most frequently requested vectors in our repository and will discuss some of the features you may want to consider as you make your choice. The first and most important thing you need to know is your expression system or environment. The host organism will determine the type of vector that you will need. You will also have to make sure that your plasmid has been incorporated into the host organism, usually achieved with the proper selection marker or antibiotic resistance. Next, consider the expression level of your construct: would you like to stay as close as possible to the basal expression level, induce expression at an opportune time or go all out with constitutive high level expression? Finally, you can add bells and whistles to your construct. If you are planning to track your protein in the cell or purify it – and you do not have a specific antibody against the protein available – you can always add an epitope tag or a fusion protein. One of our most popular mammalian expression vectors, c-Flag pcDNA3, comes from the pcDNA series. It has the CMV promoter for mammalian expression, a multiple cloning site to insert YGOI, a bacterial selection cassette for growth and cloning in bacteria and a mammalian selection cassette to screen for positive transfected cells. The addition of an in-frame fluorescent fusion protein will allow you to visualize YGOI in vivo (try pcDNA3-EGFP). If you can get away with generating transiently transfected cells, you will not need a mammalian selection cassette (e.g. 1435 pSG5L Flag HA). You can also upgrade your basic mammalian expression system and go for a lentiviral or a retroviral backbone. This is considered to be a more robust expression system and has its advantages; however, remember that you will need accessory packaging vectors to generate the virus. This system is great for overexpressing YGOI in an isolated, controlled environment. In most cases bacterial expression vectors are inducible (e.g. pBAD LIC cloning vector (8A)) and have an epitope tag (6xHis or GST) to affinity purify the expressed protein with a specific resin (e.g. 6xHis containing pDEST-HisMBP). After purification the protein can be released from the resin and used for various binding or folding assays. There are several types of yeast expression vectors. Consider your applications and experimental design. 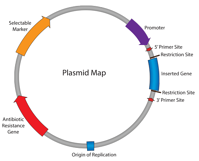 You can create a new strain with a disrupted gene by transforming wild-type yeast with an integrating vector expressing a selection cassette with 5′ and 3′ flanking sequences matching the sequences upstream and downstream of the open reading frame (ORF) of interest – try pRS plasmid shuttle vectors. You may prefer the more traditional approach of an autonomously replicating vector that carries either a wild-type version of YGOI to rescue a mutated strain or a mutated version of YGOI to test the different phenotypes of the specific mutations. For these purposes Addgene has a large collection of yeast expression vectors with various markers and promoters. If you need to visualize YGOI on a western blot or under a microscope, we offer a collection of vectors carrying several fusion proteins. Pick your promoter, selection cassette and visualization vehicle to conduct your custom experiment. The vast majority of fly vectors are based on p-element, random or targeted, integration into the fly genome and are under the Gal4 inducible UAS promoter. Other vectors can be expressed in fly culture cells like S2 and carry the metallothionein promoter (e.g. pMT-puro). There are several approaches to studying YGOI's function in worms. Some of the more popular studies involve using a reporter vector to tag YGOI with lacZ and/or GFP (e.g. pPD80_08) and following the expression pattern of a defined promoter region, ectopically expressing YGOI in a pattern that allows the function of the encoded protein to be assayed (e.g. pPD95_86 and pPD57_56), or knocking down YGOI through RNA-mediated interference (e.g. L4440) and observing the downstream effects. We have a variety of other types of vectors for most applications used to study gene function. From making transgenic animals, gene targeting and genome modifications to reporter vectors (e.g. pBV-Luc) and gene silencing (e.g. pLKO.1 - TRC cloning vector). Check out our complete guide to empty backbones for additional details and guidance for choosing your perfect plasmid backbone. Or just ask – leave a message in the comments below and an Addgenie will help you find what you need.